There was so much going on in this episode - something I love so much about this show is that it's so rich with themes, characters, and plots. It doesn't hold back, or maybe it knows exactly how much to hold back, and it all works. Every new thing they add seems so natural and like it just belongs there that it never feels like too much, even though when you step back it's such a huge story they're putting together. Do you get the sense that they're getting everything in place to wrap it up? I don't get that sense at all. If anything I feel like they could keep churning these out forever. 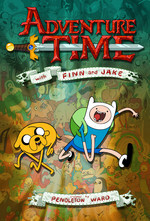 So yes, I undestand how it would feel that they're wrapping it up, revisiting a lot of previous plot points (just the episode before Bun Bun you'd got to see Finn Sword again, Grass Sword, those weird angular folks that (I think) appeared in the first season, and other back-references (BMO loves air...)) but at the same time they're creating new plot possibilities. I'm generally very happy with how this season turned out so far. The overall theme for every episode in season 7 (except the guest animation) has been the passage to adulthood. They're not rekindling things between Finn and FP, they're just showing how the two of them have matured lately. Finn admitting he was wrong was a huge, huge step for him. (Admittedly, rekindling was a bad word choice. I was trying to merely suggest that they might become friends again. They're in production on an eighth season, so the end at least won't be coming anytime soon. The show makes a lot of money for CN, and it doesn't seem to be getting tired creatively. I am beside myself knowing that eventually we'll have seen the last Jesse Moynihan episode (imo, Moynihan is the rock star of the bunch), but there are so many brilliant writers and artists working on the show that some late-period-Simpsons-style decline seems quite evitable. I, too, am worried about the end of Moynihan. On the other hand, I've been rewatching, and it's difficult to overstate just how important Rebecca Sugar was to the earlier episodes, but the show has gotten along OK without her.